Are there modern day Paul Revere’s, fervently warning a nation of impending danger? 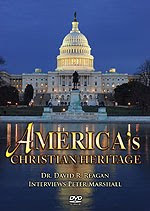 In a Christ in Prophecy series titled “America’s Christian Heritage,” Dr. David Reagan interviews a modern day Paul Revere who is on a mission to save his country by bringing it back into God’s grace by returning in repentance to it’s Christian roots. Dr. Reagan: Peter, tell us about yourself and your ministry. Rev. 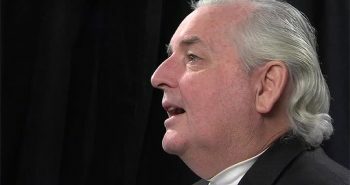 Marshall: I was ordained as a Presbyterian Minister in 1965, a long time ago now, and served as an Assistant Pastor and then had my own church on Cape Cod until the end of 1977. At which time I decided that the Lord wanted me to do full-time what I had been doing part-time, which was traveling to respond to invitations from different churches and groups across the country to come and minister on growing in Jesus, growing in discipleship, and living the Christian life. But, in that same year The Light and the Glory, our first book, was published on America’s Christian heritage. What has happened in the years since then is that the Lord has sort of changed my ministry into a national ministry of helping modern American’s recover the truth about this nation’s Christian heritage and His hand in our histories specifically. I still travel, teaching and preaching wherever I am invited to do that. Often it is weekend conferences on America’s Christian heritage or sometimes Christian growth and discipleship. I also do a lot of writing and have been doing a lot of that since 1977, and I plan on continuing that. Dr. Reagan: Well, folks, as Peter said, in 1977 his life was really changed by the publication of his seminal study of the Christian Heritage of our nation. 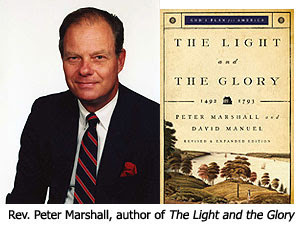 The book was entitled, The Light and the Glory. It traced the religious heritage of our nation from 1492 to 1793. And, in the 30 years since that time, Reverend Marshall has published two sequels, bringing the history up to the year of 1860. He is now working on one that covers the Civil War. Dr. Reagan: In 2009, a second edition of the original book was published. Peter, let’s talk about this great book of yours, The Light and the Glory. The first edition of this came out over 30 years ago. What motivated you to write this book? Rev. Marshall: Back in 1975 when I started, it became obvious to me that America was starting to slide downhill. We were losing the moral and spiritual foundations of the nation of the society. We were a society that was increasingly in trouble. We’d been through the Watergate Crisis and our institutions were beginning to show signs of corruption. The sexual revolution was in full bloom. Things were not going well. I began to feel the Spirit of the Lord leading me to check into American history. I had been a history major in college, but that was before I had given my life to Jesus. I thought I would never have anything to do with history anymore when I went into the ministry. I thought that was just a part of my former life. But, I had a great love of the history of this nation and wanted to see if I could find the evidence of God’s hand in our American past. And, that is what prompted the beginning of that book. Dr. Reagan: I tell you, it does seem like we’ve been going downhill ever since then. You have just come out with a new edition of this book after 30 years. Why did you do that? Rev. Marshall: We found with the original book overwhelming evidence of God’s hand in our American past. I mean, far more than we could begin to put into one book. Through the years since that book came out, oh, there were a few mistakes, minor things that probably nobody but me would notice that I wanted to correct, but I also wanted to add some new material. For people who loved the first book they will love this new edition even more. 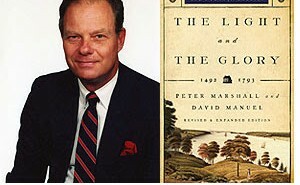 There is new material on George Washington, on Samuel Adams and on the lost colony of Roanoke. I did a whole new appendix on the Christian faith of other Founding Fathers beside Washington, because I get so sick and tired of hearing this endlessly repeated mantra that the Founding Fathers were all a bunch of deist, which is flatly untrue. Dr. Reagan: I can attest to the fact that you have a lot of new material, because I have read both editions my edition is very much marked up. I just loved it! I couldn’t put it down. 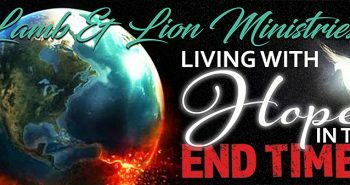 Warning the nation on impending doom if it's based on sound Biblical doctrine/prophecy is great but when one strays from that it does no service to the cause. What was that guy's name, Wilkerson?, who warned of impending riots and fire, etc. in New York or New England? Bob posted a reply on his ‘Shofar Ministries’ site to a private letter (not shown) from a Pretrib friend on his ‘normal’ blog as well as his Postie site. You MAY be interested to take a peek, ifn you aint all zausted and plain tuckered out after magnificently Contending For The Faith with ferocious Fred? My reply to Bob is based on what Bob calls his ‘blindness’ for not being able to see a PREtrib, only a POSTie Rapture. (Mine is unlikely to be posted?) Here is the link. Because you do not accept a distinction between Israel and the Church; it means you are misapplying Scripture which is addressed to Israel, and wrongly applying it to the Church. You are therefore removing prophetic Scripture out of context causing an inevitable pretext. Because you follow Covenant Theology’s (or is it Progressive Dispensationalism – same difference) interpretation of PROPHECY, which is to spiritualize the text (allegory) you are forced to cause a ‘knock on effect’ of changing the literal meaning of many other Scriptures. It is sadly inevitable and IS happening. When you read that Jesus went into the Temple in Jerusalem, you Bob, interpret that in a NORMAL way like the rest of us, meaning the ‘Temple’ in ‘Jerusalem’, NOT, for example as the ‘Church in Rome’. When John the Baptist was beheaded, you Bob, interpret that to mean his head was cut off, NOT spiritualize it into John losing his head in insanity. So if you are happy to interpret all other Scripture in a ‘normal’ way; why suddenly switch over to interpret PROPHETIC Scripture allegorically? 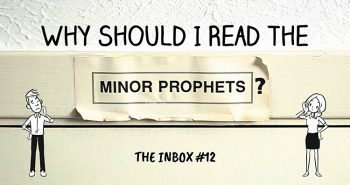 The ONLY way to interpret ALL Scripture is the way the Prophets, Jesus and the Apostles interpreted Scripture, including prophecy, and that is the NORMAL way all literature is meant to be interpreted. The exception is when it is written deliberately as allegory, but even then it is very obvious to the reader. This, my brother in Jesus, is where your ‘blindness’ comes from. EI, I went to Bob's site and read the comments. I'm still puzzled as to why he thinks that pretribbers spiritualize Matt 24 because they don't believe v31 is the rapture. 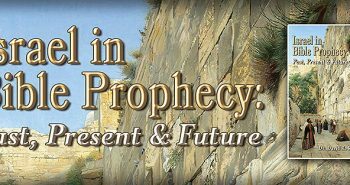 A pretribber will promptly go to a number of OT prophecies promising a gathering of Israel, one of which even includes a trumpet. I found Bob's site two or three years ago. IMO he's not objective. I did note that when he renounced pretrib he got a big visit from the then pre-wrath heavies congratulating him. They were hoping to convert him. Bob has surprised me by posting my comments! I am always amazed at his un-objective stance, so you and me both. When I first spoke to him, he was only considering leaving Pretrib, but his reasons were muddled even then. It was mainly based on an obsession about Peter’s death. It made me scatch my head for a while, but not for long. Months went by before I spoke to him again, and by then he was mid-trib, probably bordering on Prewrath. Eventually he became a Postie and sometimes there has been a bit of Preterism thrown into the mix; later he started up his Postie site. It was the start of my blogging and I was terrified, but lost that when I saw how biased he had become and Ooo have we had some humdingers! The amazing thing was that the more I posted, the more the Lord revealed the facts to me. It was certainly a sharp learning curve. It was also exciting; because I was being led to understand about the dangers of Covenant Theology’s hermeneutic. I didn’t even know I was a ‘dispensationalist’ until Bob told me – so I was forced into praying and studying about that, then up popped ‘Progressive Disp’; and off I went again. I already had ‘Israelology’ by A.F. but hadn’t read it; I was stunned that I had all the information at my fingertips and hadn’t realised. Page 256 of “Israelology: The Missing Link in Systematic Theology” by Arnold Fruchtenbaum. Does that help explain your puzzle? Really and truly C.T./ PD and Dispy aren’t reading from the same page at all, no wonder their reasoning is so puzzling. After that, I had to learn what Grace really means – hopefully I am getting there with the loving assistance of Nathan and his gang?